We took the Amboy Road from Twentynine Palms to Amboy. 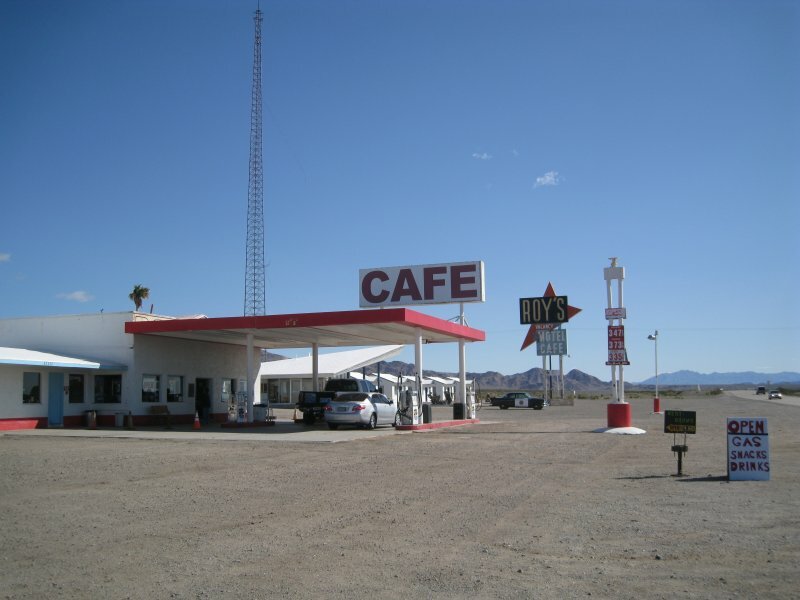 This was a famous stop on Route 66 in the Mohave Desert. Roy's (see photo) was a restaurant, car repair, gas, and motel stop on this route from New York to LA and opened with the highway in1926. In 1973 the highway was bypassed with the completion of I-40. Today you can get gas, and bottled water, cold drinks, and snack. There is no brewed coffee as the health department won't allow trucked in water. The restaurant was left as is with the lunch counter intact and and a stack of photo albums. A mile along Route 66 is the entrance to Amboy Crater. This volcano last erupted 10,000 years ago. We walked 3.1 miles to the cinder cone, climbed to the rim and toured the craters in the crater. It was my first time in a volcano. We continued driving north through desert, sand dunes at Kelso, to Baker. My last visit to Baker was July 2, 1950 with my family driving in our 1950 Studebaker from Toronto to Los Angeles. My father wrote in his blog which records that because the daytime temperature was 120 degrees, we drove through the desert at night and had breakfast at Baker. Another 51 miles and we arrived at the Tecopa Hot Springs and Campground which is operated by California Land Management. The rate is $19 with power, water, and use of the hot spring. For the first time on this trip there is no Verizon cell phone service here.